In this post, we discuss, in detail, the appraisal of a fictitious rural property near Austin, Texas. If you know you need the rural property value of a home or acreage you or a client owns, you can read about some of the details involved in this type of property appraisal, or you can just order an appraisal now. Want to take a drive to the Texas countryside? When living in Austin that’s not so hard to do. I remember when I first moved out here just over 9 years ago, that used to be one of my favorite weekend pastimes: grab the family and go out for a drive and just see where the road would take us. Little did I know then that I would eventually be appraising some of these country homes and large acreage properties. Appraising rural property is definitely a different animal. We see little 600 square foot homes that sit on 30 plus acres, or enormous 9000 square foot homes that sit on 80 plus acres with additional features such as large barns, horse facilities, workshops, pools and sometimes even landing strips. Appraising these types of homes is not anything like appraising your typical subdivision home. Data collection tends to be more hectic and finding comparable sales can be tedious. In some cases you might end up driving over twenty miles away just to get a picture for one of your comparable sales and repeat that at least another three times to get all the comparable sales needed to complete your report. So let me take you through the process of completing one of these assignments. For this particular case study, we’re going to be appraising a fictitious property in the Texas Hill Country, outside of the city of Austin. The property in question is a 3580 square foot home situated on 5 acres with a 2 garages – one attached 3 car garage and an additional 2 car detached garage. This property also has a pool with a spa and a cabana with an outdoor kitchen. Due to the spread-out nature of the area and lack of public utilities, it is on a septic system and a well system for water and there haven’t been many recent sales. The subject is mostly surrounded by vacant land with some similar subdivisions scattered throughout the whole county. So far this is all the information that we’ve been able to gather from the client. Research, investigation and data gathering starts before we take our drive out to the property. The rural appraiser has a lot of data to gather. First, we gather as much data as possible by running as wide of a search as possible or necessary in the MLS. Once we have a nice collection with which to start, we take our drive to the subject property to be appraised. Once we get there we’re able to see additional features, such as a panoramic hill country view, a storage room above the detached garage, extensive landscaping, perimeter fencing, gated entrance, extra fireplaces and fire pit. We’re also able to determine the quality of construction materials such as stone exterior walls, granite counter tops throughout all wet areas, hardwood floors, upgraded lighting/plumbing fixtures and so on. Next, we gather more specific data about the subject property for our analysis. Once we’ve gathered all this data we head out to visit and photograph our selected comparable sales. In this particular case we got lucky and found one closed sale in the subdivision that sold within the last twelve months. However, we weren’t so lucky on the other sales since we had to drive over 3 miles for one, and over 7 miles for the other ones. Fortunately, these proved to be excellent comparable sales due to similar amenities and pretty much the same lot size. Finally, back at the office we enter all the specific data for the subject, and enter all the data for the comparable sales. In the figure below we show a sample market grid we use to analyze and make adjustments for differences for each comparable sale for rural property valuation. Please remember, although this is for demonstration only, we’re trying to make it as real as possible to a typical rural appraisal. So, let’s start from the top. The very first line allows us to show a short analysis of the activity taking place over the twelve month period prior to the effective date of the appraisal. Line 1 above specifically asks for the number of comparable active listings currently available in the market. In this case we have specifically entered a total of 18 active listings ranging from $399,000 to $530,000. On line 2 we’re asked to enter the number of closed comparable sales in the same twelve-month period. In this instance we have entered a total of 26 sales ranging from $348,000 to $523,300. By entering these figures we’re able to provide the Lender’s underwriter a clear image of what’s taking place in this particular submarket. As you can see all these line items are placed side by side. The first column to the left is the subject property and all its features and amenities are listed down the line. The other three columns represent the first three comparable sales being utilized in the analysis with all their features and amenities listed down the line as well. In this particular scenario, the adjustments go as follows. I will also offer some simple explanations on how we typically arrive to these numbers. 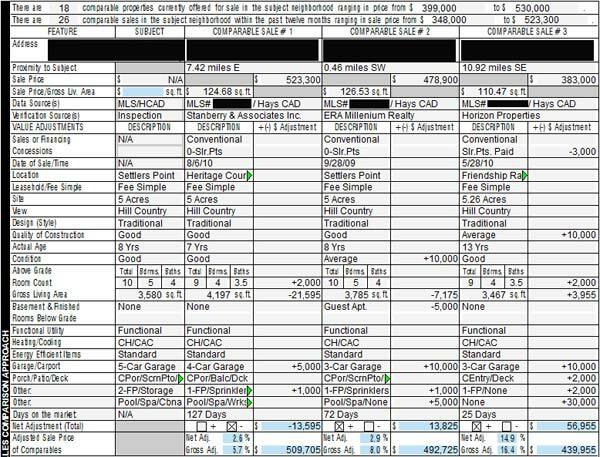 The first adjustment on the grid, is as you can see on column 3 (comparable sale 3), for $3,000. This adjustment was made to reflect the seller-paid closing costs on behalf of the buyer (aka sale concessions). The second adjustment on the grid is also on column 3 for $10,000 for quality of construction. In this particular case the subject property has granite countertops and hardwood floors. The comparable sale lacks these features – it has tile countertops and carpeting. This particular adjustment is derived from the market, also known as matched pair analysis which helps us determine how much more buyers are willing to pay for these items. Another way we also look at these items is from experience and knowledge of the costs associated with bringing the other property to a similar standard minus estimated depreciation (cost does not equal value). The third adjustment on the grid is on column 2, an upward adjustment of $10,000 for inferior condition. In this particular case MLS data indicated that this particular comparable sale sold in need of repairs. This adjustment is based on the typical costs associated with bringing this property to the same standards and condition as the subject property. The fourth adjustment as we go down the line is for bathroom count, in this case upward adjustments of $2,000 for sales 1 and 3 were made for the additional ½ bathroom the subject property has. The fifth adjustment is for square footage differences. Guidelines tell us the following: when possible, line adjustments should not exceed 10% of the comparable’s sale price, size differences between the subject and comparable sales should not exceed 25% and net adjustments and gross adjustments should not exceed 15% and 25% respectively. In this case after utilizing certain widely used formulas we have utilized a $35 per square foot adjustment for living area differences. The sixth adjustment is for parking facilities, in this particular scenario the subject has 5 garage spaces, the typical difference for the additional garage can be $8,000 to $10,000 depending on location and submarket (demand for this feature), however, in this case we were not able to find any comparable sales with the same feature and therefore we can conclude this to be an over-improvement, therefore, a lower adjustment would be made. The last adjustments down the line are for fireplaces, sprinkler systems and finally pools and spas. In this particular case comparable sale 1 is considered to be the most similar to the subject and sale 2 is right behind, as you would guess, primary weight would be given to these two sales as they are considered to be the most similar in all aspects. One form that came out in 2009 is the 1004MC, also known as the Market Conditions Report. Some appraisers hate it, because it just makes extra work for them. When this form is used properly, however, it can be a great aid in determining the state of the specific submarket you’re working in (i.e., comparable homes, comparable sites, comparable locations, comparable amenities). Below I’ve included a snapshot of what the 1004MC grid looks like. This one came from the same fictitious property above and was also included as part of this specific analysis. The first column shows the inventory analysis with the next three columns indicating the first six month period and the second 6 month period split into two (a little confusing I know) and the last column is to show the overall trend. Line 1 asks for the total # of closed sales for each period: in this particular case there were 13 comparable homes that closed in the first 6 month period, followed by 4 closed homes in the first half of the second period and 8 closed homes in the second half of the second period. This shows that this particular has remained somewhat stable; 13 homes in the first period and 12 homes in the second period. Line 2 shows us the absorption rate. The absorption rate is calculated as follows: the number of homes divided by the number of months in the period for example: column 1 shows us an absorption rate of 2.17 which was arrived at by taking the 13 homes sold and dividing it by 6 (the number of months in this period) which means that homes in the first period were selling at a rate of 2.17 per month during the first 6 month period. Now if you do the same thing for the second period by combining both 3 month periods you would arrive at an absorption rate of 2 which means homes for the second 6 month period were selling at a rate of 2 homes per month. The beauty of this form is that it gives us a glimpse at what has taken place during the previous twelve months, it gives us the median comparable sale price, it tells us whether there’s an oversupply of comparable homes in the market, it tells us the median days on the market (how long it is taking to sell these homes) and so on. Only those brave enough to read this far get that little bit of rural appraiser humor. After all, we’re not actually known for being a barrel of laughs at the neighborhood holiday party. We hope this analysis has been informative for you and that you have a little better understanding of the detail of work, and the expertise required to determine rural property values. If you have any questions and want to talk about an appraisal for your rural property, please call (512) 541-2107.